Take your Genomic Profile wherever you go with the "My ActX Genomic Profile" app. Available on Apple and Android devices, our free patient app makes it easy to use and share your results with health care providers. Drug-genome interactions: Our Med Check functionality lets you enter the name of a medication to find out if there could be side effect, efficacy or dosage issues due to your genetics. You can also check the Medications section in your Profile to view the complete list of medications affected by your genetics. Hereditary risks: Your personalized profile offers insights into your actionable genetic risks, including cancer, cardiovascular, and metabolic risks. Our detailed summaries and additional resources can help you understand how your genes can impact your health. Carrier status: Your profile also shows genetic conditions that you carry and could pass on to your children. Carriers do not normally develop a disease, but if the other parent is also a carrier, then there is a chance that children could develop a genetic condition. 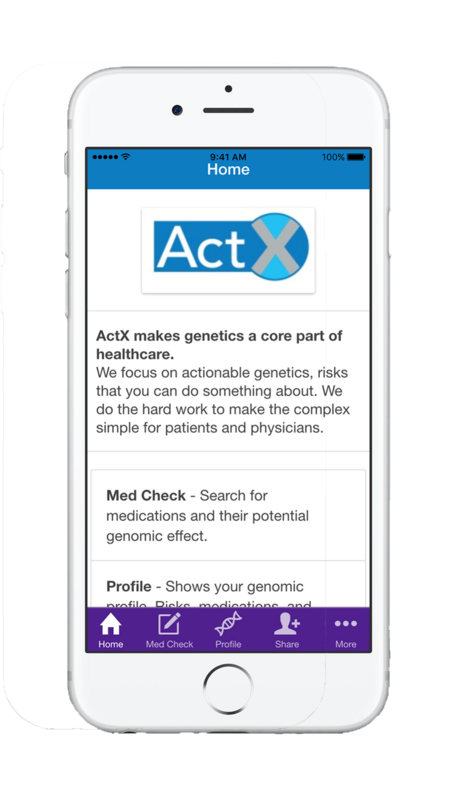 Share with your health care provider: The My ActX Genomic Profile app allows you to share your actionable genetic information with other health care providers who are not signed up with ActX, but are still involved in your care. Simply press “Share” and enter your physician's information. In less than 60 seconds, they can get the information they need to personalize your medical care. The My ActX Genomic Profile is intended for existing ActX customers. Not an ActX customer? Learn how ActX is personalizing medical care with genetics. The ActX Service is an informational and not a diagnostic service. The Service looks only at selected variants (DNA variations) for the targeted genes and not for all possible genetic variants. The features described outline the ActX Full Service option. Other ActX packages do not necessarily include all of the above information.